Why Go With Our Casement Cleaning? Take advantage of a safe service in West End that has earned over 95% of positive feedback! Q: Who will be responsible for washing my casements? A: Your panes will be treated by a team of verified and reference-checked window cleaning technicians. Q: What services does window cleaning West End provide? A: The cleaners will perform exterior window cleaning with the help of modern water-fed pole gear on the market. For premises above the fourth storey, we'll dispatch experienced abseilers for rope access window cleaning. For inside pane polish, the team will employ standard ladders and squeegees. Q: Can you still remove smeared grime on a rainy day? A: A couple of of raindrops won't sabotage the West End window cleaners' work – rainwater is usually limescale-free. However, if we face a rainstorm, then we will kindly ask you to suspend your appointment for another day. Q: Can you renew my PVC frames and sills as well? A: Yes, any PVC or UPVC frames and sills that your property features will be cleaned for free as part of our service. Q: Can you conduct your service in my absence? A: As long as the specialists can enter your front gate, they can rinse away all muddy streaks without you having to be around. If your panes need a meticulous interior polish as well, then we'll carry out a quick key pick-up and delivery service. Q: Do I need to have an exterior or an interior water source? A: Usually, the distilled water storage inside the team's cleaning vehicle is always full. In case the tank is empty and with your consent, the cleaners can easily link the water-fed pole to any available water source. Q: Do I need to meet any special preconditions before the team arrives at my doorstep? A: Once we tell you that the team's en route, you'll need to ensure that they can enter your premises unimpeded. In addition, the cleaners will require a parking spot within 30 metres from your property and on the same side of the casements you want cleaned. Q: What will happen if the team has been delayed? A: If the team is nowhere to be seen because of serious traffic, we will notify you about the hold-up and contact you as soon as they arrive. With our window cleaning in West End, you get a proper rinse of your sash windows, skylights, conservatory roofs, French doors, and other glass surfaces at modest fees. We will even offer a free of charge wash of all PVC & UPVC ledges and frames! For a full list of our prices, please see our price table below. We've developed our window cleaning in West End with usefulness in mind. As a result, our service is now regularly scheduled by commercial and household customers alike. Let's have a look at our window cleaning options on offer. With our external cleaning, you can effortlessly polish the panes of any property with four or less floors. The seasoned adepts will show up in a cleaning vehicle. The window cleaners in West End will then link a intuitive water-fed pole to the van's water container. The special filtrated water will be released through a brush-head add-on at the pole's end under high pressure. When the fluid vanishes under the sun, your windows will stay smudge-free for weeks to come. For properties above the fourth floor, we'll send experienced climbers for rope access window cleaning. Carrying durable ropes, cherry pickers, and ladders, they will analyse and refresh any lofty commercial property in a matter of hours. Should you require risk assessment reports, we'll gladly provide them for you. We also take our job to heart and will adhere to all safety regulations. If your panes are smudgy on the inside as well, the experts can carry out inside cleaning with ladders and sponges. 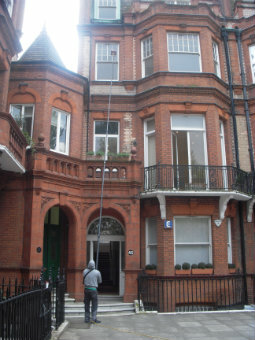 As we garnered more and more positive reviews from our clients, the need for window cleaning in West End has noticeably skyrocketed in close by areas. You can find the locations we've added in the list below. Another quick and easy way to get a free instant quote or to book window cleaning services West End W1B is through our web site.